The nice folks at Purex have sent me a sample of their new product Purex Complete Crystals so that I could try it out and even let some of you try it out. I know what you are thinking. 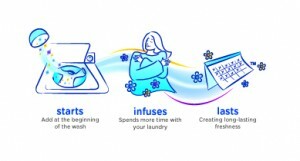 I have extolled the virtues of homemade laundry detergent and even various natural alternatives to dealing with laundry issues so why would I agree to tell you about my experience with a commercial laundry product? Well, because a.) I never look a gift horse in the mouth b.) Purex Naturals is my standby alternative to homemade laundry soap c.) the 3-in-1 sheets are ingenious and d.) because this product is actually made up of 92% natural ingredients. 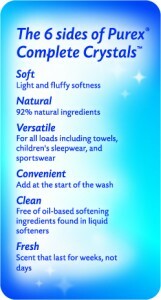 Purex Complete Crystals is a new way to soften your laundry. It looks and smells like bath salts and is really easy to use. Just throw it in your laundry and let it do its thing. My clothes have come out so soft and smell wonderful for days. Another great aspect of the crystals as opposed to other methods of fabric softening is that it isn't oil based. Which means it doesn't coat the fabric fibers and in the case of children's sleepwear, does not break down the flame retardant aspect. I have coupons for a FREE bottle for three lucky readers to try. All you need to do is become a follower of Pary Moppins Perfectly Practical. That's it. Diva will draw 3 names from a fabulous hat on Sunday, March 13th and I will announce the winners on Monday, March 14th. If you are a winner (good luck!) then I will send you a coupon for your very own free bottle to try yourself. 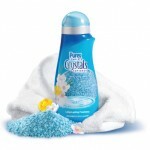 If you would like more information on the Purex Complete Crystals and a coupon, check out their website here.